This valuable San Francisco package includes your choice of 3 popular tours and attractions of San Francisco! Build your own individual itinerary, and you can explore San Francisco on your own pace! Up to 50% savings comparing to separate purchase! Build your own San Francisco experience and SAVE BIG! This valuable San Francisco MEGA PASS includes 3 options from over 25 popular Tours and Activities in and around town. The pass is valid for 7 consecutive days! 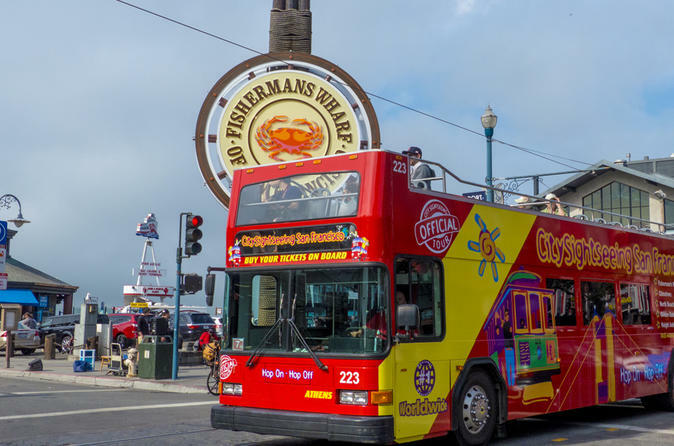 Choose any of the world famous Hop-On Hop-Off Tours to see all major sites of the city, such as the Golden Gate Bridge, Golden Gate Park and Downtown San Francisco during the Official City Tour. Explore Ocean Beach right at the Pacific and see the San Francisco Zoo during the Parks & Beach Tour, or cross the Golden Gate Bridge on a ride to charming Sausalito. Hop on and hop off at any of the stops along the routes and enjoy live narration by entertaining tour guides with unlimited ticket use for 24 hours. Play with the Sevengill Sharks at the Aquarium of the Bay and see the city’s skyline from the water during a fascinating Bay Cruise or during a thrilling ride on the Rocket Boat. Take a bike to explore Golden Gate Park or ride a storytelling GoCar along the Marina. Visit the impressive California Academy of Sciences with its own rainforest, aquarium, planetarium, and national history museum. Discover the life of Mickey Mouse’s creator at the Walt Disney Family Museum, meet Barack Obama and E.T. at Madame Tussauds, or learn about modern art at the SFMOMA. Take a ferry to Angel Island and Sausalito with great views of Alcatraz Island and the Golden Gate Bridge. Or choose from many other tours and attractions, making your San Francisco visit the most exciting and fun experience ever! Choose the attractions upon redeeming the voucher in San Francisco, no need to pre-select when booking.